St. John’s Prep wanted to generate incremental non tuition income, reduce expenditures, and increase return on assets to fund depreciation, as well as meet 100 percent of demonstrated need for all accepted students. In the longer term, they hope to keep tuition increases to a minimum to help future families with affordability. 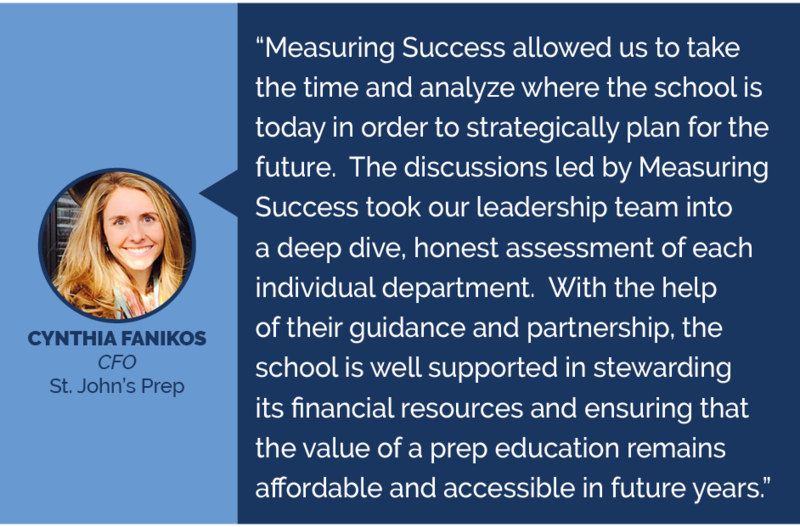 Measuring Success provided comprehensive comparative benchmarking analysis to identify opportunities to improve relative to peer Catholic and independent schools; documented opportunities to increase non tuition revenue, reduce expenses, and increase return on assets. Measuring Success met with school leadership who formed working groups. We worked on a tight timeline to refine the goals of each working groups, review relevant materials and make decisions.